Our pets are certainly treated as family members. They love us so much and we love them back, and occasionally they sit still and pose for photos. So there's no reason why we shouldn't spoil them every once in a while. 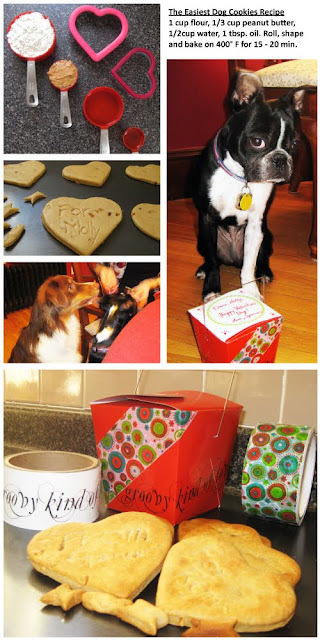 I found the easiest dog cookies recipe somewhere online and I baked some heart-shaped doggie cookies for Valentine's day for my puppy Spencer and his playmates. I just love making homemade treats both for pets and for people because you know exactly what's in them, i.e. no chemicals or preservatives, or byproducts. I used TapeSwell's Dottie and Groovy Love decorative tapes to add some fun to the red takeout box I used to hold the cookies. It was a nice touch that put a smile on everyone's face and after all isn't that what holidays are all about? The recipe is so simple and it smelled so delicious that even I took a bite. We've been very busy here at TapeSwell doing a bit of a makeover to our website, which should go live very soon. We are also working on getting out new patterns and we have a bunch of other surprises coming up. Today, we would like to share the Decorated Package of the Month for March. 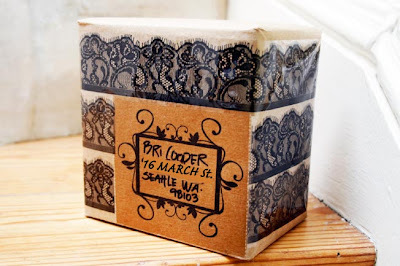 The Black Lace and the Scroll Label Tape are two of our best selling products and there's a reason for it. They are pretty good at dressing up a box.